Dive vessel Rainbow Runner is usually at the dock right next to the Moongate, 30 minutes before the departure time. Divers are invited to scramble aboard thus proving their proficiency in the ability to walk (Usually a requirement, though amputees and others with physical challenges have little difficulty). The boat has sturdy side steps for when when the tide is low. Those who have suffered the ravages of time, or our modern lifestyle, are welcome to take as much time, and are given as much assistance as necessary to either get aboard, or later on get down the ladder in the water. During the dive any physical limitation is reduced by feeling lighter underwater. Once aboard, out of the sun and sheltered in the spacious airy cabin, folks fill out the form required by law, if they have not done so already. There is also a convincing sales pitch on the undersea portraits we provide ($20 per person plus $10 for a memory stick containing the portraits plus fish pictures, invertebrate close-ups and back-in-the-day black and white photos of my father’s). A very short video is usually included. We aim to get great photos, like you see on this site, with fish that normally do not approach divers, right up in the shot. Payment is made by either cash or by card. We have a mobile device to process cards. If you book by phone, the card number we take upon booking is to help you realize you have a committed booking. Bring your card if you wish to use it. If the weather is unsuitable we do not need to do refunds because no charge is put through till you present your card. If you had clicked an orange booking button and pre-paid, then I will reverse the charge promptly. Once all arrive, we cast off dock lines and make our way toward the reef. Google view our dive site. 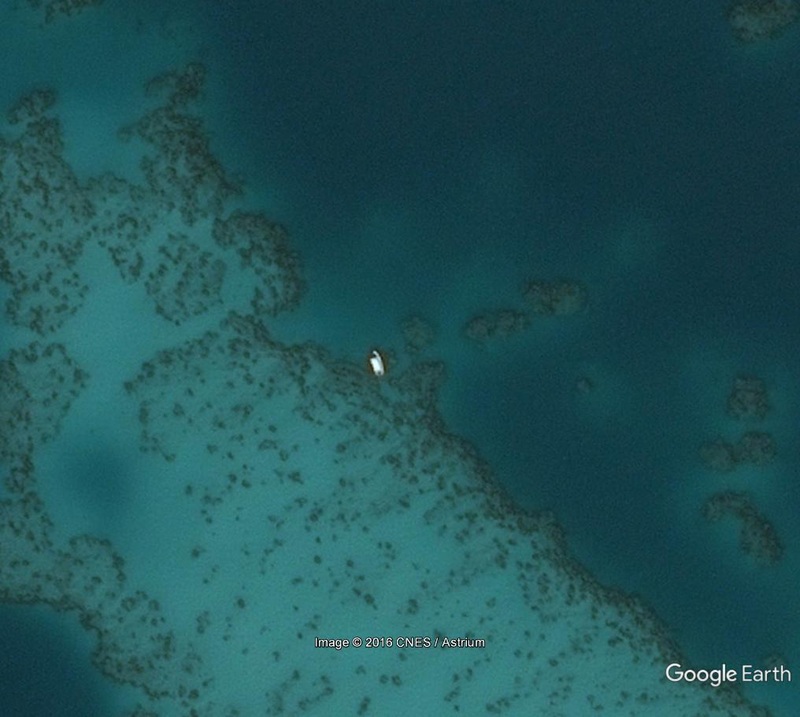 In this archived photo, our boat is actually visible from orbit. The sandy area surrounded by reefs is called Halfway Flat. Our diving area is the sandy area just below below the stern of the boat. While under way we all sit inside the cabin for the briefing where all discover what they will, and will not see.